Every day, hundreds of millions of people use Facebook to share their thoughts on big moments happening all around them. Whether it’s talking about a favorite television show, cheering on a hometown sports team or engaging with friends during a breaking news event—people on Facebook connect with their friends about what’s taking place all over the world. During primetime television alone, there are between 88 and 100 million Americans engaged on Facebook - roughly a Super Bowl-sized audience every single night. The recent "Red Wedding" episode of Game of Thrones, received over 1.5 million mentions on Facebook, representing a significant portion of the 5.2 million people who watched the show. And this year's Oscars buzz reached an all-time high on Facebook with over 66.5 million interactions, including likes, comments, and posts. To date, there has not been a simple way to see the larger view of what's happening or what people are talking about. To bring these conversations more to the forefront, we will be rolling out a series of features that surface some of the interesting discussions people are having about public events, people, and topics. As a first step, we are beginning to roll out hashtags on Facebook. 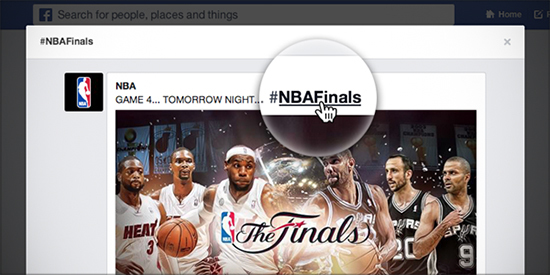 As of June 12th, hashtags will be clickable on Facebook. Similar to other services like Instagram, Twitter, Tumblr, or Pinterest, hashtags on Facebook allow you to add context to a post or indicate that it is part of a larger discussion. When you click on a hashtag in Facebook, you'll see a feed of what other people and Pages are saying about that event or topic. Learn more about hashtags in the Facebook Help Center.